We beseech thee, O Lord, pour thy grace into our hearts; that we who have known the incarnation of thy Son Jesus Christ, announced by an angel to the Virgin Mary, may by his cross and passion be brought unto the glory of his resurrection; who liveth and reigneth with thee, in the unity of the Holy Spirit, one God, now and for ever. 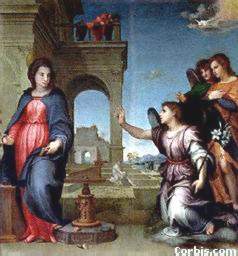 Pour your grace into our hearts, O Lord; that we who have known the incarnation of your Son Jesus Christ, announced by an angel to the Virgin Mary, may by his cross and passion be brought unto the glory of his resurrection; who lives and reigns with you, in the unity of the Holy Spirit, one God, now and for ever. 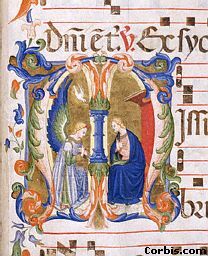 In the first chapter of Luke we read how the angel Gabriel announced to Mary that she had been chosen to be the mother of the Christ, and how Mary answered, "Here I am, the handmaid of the Lord. Let it be to me as you have said." It is reasonable to suppose that Our Lord was conceived immediately after this. 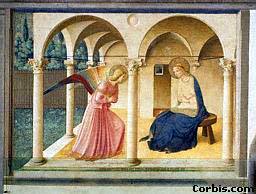 Accordingly, since we celebrate His birth on 25 December, we celebrate the Annunciation nine months earlier, on 25 March. For many centuries most European countries took 25 March, not 1 January, as the day when the number of the year changed, so that 24 March 1201 was followed by 25 March 1202. If you had asked a Christian of that time why the calendar year changed so awkwardly partway through a month, he would have answered: "Today we begin a new year of the Christian era, the era which began X years ago today when God was made man, when He took upon Himself a fleshly body and human nature in the womb of the Virgin." The following paragraph is from Chapter 14 of the book MIRACLES, by C S Lewis. ...one of those features of the Christian story which is repulsive to the modern mind. To be quite frank, we do not at all like the idea of a "chosen people". Democrats by birth and education, we should prefer to think that all nations and individuals start level in the search for God, or even that all religions are equally true. It must be admitted at once that Christianity makes no concessions to this point of view. It does not tell of a human search for God at all, but of something done by God for, to, and about Man. And the way in which it is done is selective, undemocratic, to the highest degree. After the knowledge of God had been universally lost or obscured, one man from the whole earth (Abraham) is picked out. He is separated (miserably enough, we may suppose) from his natural surroundings, sent into a strange country, and made the ancestor of a nation who are to carry the knowledge of the true God. Within this nation there is further selection: some die in the desert, some remain behind in Babylon. There is further selection still. The process grows narrower and narrower, sharpens at last into one small bright point like the head of a spear. It is a Jewish girl at her prayers. All humanity (so far as concerns its redemption) has narrowed to that. The following quotation is from Martin Luther's sermon "On the MAGNIFICAT" (the Song of Mary, Luke 1:46-55). The "great things" are nothing less than that she became the Mother of God, in which work so many and such great good things are bestowed upon her as pass man's understanding. For on this there follows all honor, all blessedness, and her unique place in the whole of mankind, among whom she has no equal, namely, that she had a child by the Father in Heaven, and such a child. She herself is unable to find a name for this work, it is too exceedingly great; all she can do is break out in the fervent cry: "They are great things," impossible to describe or define. Hence men have crowded all her glory into a single word, calling her the Mother of God. No one can say anything greater of her or to her, though he had as many tongues as there are leaves on the trees, or grass in the fields, or stars in the sky, or sand by the sea. It needs to be pondered in the heart, what it means to be the Mother of God. Luther's Works, Vol. 21, p. 326, ed. Jaroslav Pelikan, Concordia Publishing House, 1956.